Avishai Cohen is an important bassist in contemporary jazz scene. Since Avishai is from Israel, what you hear from some of his albums are very known melodies to us, as Turkish listeners. The albums, generally, have a mediterranean, (sometimes even oriental) taste. Although he is inspired by hometown there is a certain jazz effect on the arrangements and compositions. Avishai is literally a virtuoso and technically perfect bassist, knowing both mainstream and contemporary music very well. Avishai Cohen had a really hard life in New York, before becoming a famous musician. He played even in the streets and subways. His first group is Danilo Perez Trio. Then he became a member of Chick Corea’s sextet. Avishai’s first four albums, which are Adama(1998), Devotion(1999), Colors(2000) and Unit(2001) is released from Scretch Records of Chick Corea. In 2002 he founded his own record company, Razdaz Records. Between 1996 and 2002 he also performed with many great musicians such as Herbie Hancock, Roy Hargrove and Bobby McFerrin. We see 5 albums from Razdaz records, which are Lyla(2003), At Home(2004), Continuo(2006), As is…Live at The Blue Note(2007) and Gently Disturbed(2008). After 2008 he released three more albums: Sha’ot Regishot (2008), Aurora (2009) and Seven Seas (2011). Currently Avishai Cohen is performing with his trio including Shai Maestro as the pianist and Mark Guiliana as the drummer. I may make a loose generalization that can be defined as: The bassist playing the melody instead of (or addition to) rhythm becomes more well-known by the audience, and usually they can give a name to a trio or can make an album in their own names. Avishai surely can play both rhythm and melody but he loved and chose to play the melody I think. (Moreover he started to sing in his new albums.) Additionally to his formal trio, you can see names of Amos Hoffman and Itamar Odori from time to time in his albums and live performances. I have been at his İstanbul Concert in Lütfü Kırdar Kongre Sarayı on 23th of October 2011. The concert was the last one in a tour of Avishai Cohen’s last album Seven Seas. The drummer and pianist were not from his trio (drummer Amir Bresler, pianist Omri Mor). I think there is a certain difference between the original trio and the concert band especially considering the absence of the incredible Shai Maestro. However, I think the drummer Amir Bresler caught everyone’s attention with his great technique, granularity in sound, fast&soft touches to the drum set. I have never listened Mark or Shai lively but their performance in Gently Disturbed record was awesome. The performance of Alfonsina y El Mar and Besame Mucho is unforgettable ones from the concert. Avishai Cohen became very-well known to Turkish listeners, I think, after the concert. He, literally, played his instrument as a melodic one with great solo partitions. One last important note from the concert; we learned that Avishai's mother's origin is from İzmir, Turkey. Gently Disturbed is the first album I have listened from Avishai Cohen. Actually there are only two albums that you can see the word “trio” in the cover, which is At Home and Gently Disturbed. Although the drummer is Mark Guiliana in At Home similar to Gently Disturbed, the pianist is Sam Barsh instead of Shai Maestro in this album. Seattle: The melodic piano solo is signalling that we are about to listen to a great album. After the first minute the bass and drums take places. Then the main theme of piano continues a little bit more. Then a side melody is performed by the bass as the leader while the others are accompanying it. This short song is like an intro to the album. Chutzpan: The temperature is rising with drummer fast partitions. Mark is continuously travelling on his drum set. I feel like I am watching an octopus playing the drums. At last, Avishai has given some rest to him by his great solo entrance. Wow, he is really one of the best. Look at his hits on the contrabass and string pulling sounds. Lo Baiom Velo Belyla: A very well known melody which makes you feel the winter. The melody is played by the piano first, then Avishai comes to stage with his long and deep bass playing the main theme once more with a very lyrical attribute. His contrabass is very sorry to be in winter, maybe. Yes, I have made my decision about the reason why I feel the winter. It is the touches of Shai Maestro: They are like crystals dripping water drops while melting. Mark is very silent and fast at the same time on the drums. He is always filling the gaps left by the others. Pınzın Kınzın: A sound similar to what we used to hear from a cello come from the bass at the beginning, I guess, from higher octaves of the contrabass played by a bow. Avishai starts to play his well known solo. Then the drummer says to the others "Let’s go". Avishai continues the same rhythm at the beginning. Shai Maestro is responsible for the tension and he played like a vocal. I can literally hear the sentences. When there is no word left, drummer takes the melody to the beginning. After that, we again hear a solo of Avishai. This time, he is more aggressive with the strings pulled many times. Last partition of piano is more relaxed and more jazzy. Puncha Puncha: Ahhh! Shai Maestro is a real Maestro. He can be the youngest pianist I have ever heard who is this much melodic. This traditional song is very emotional and it can be felt from the beginning not only by piano but also lyrical bass and wonderful brushes used on the drums. The main theme is like a lyrical and slow rondo. But when you see the next track you will understand this is just a state before the storm. Eleven Wives: This is my favorite piece in this album. 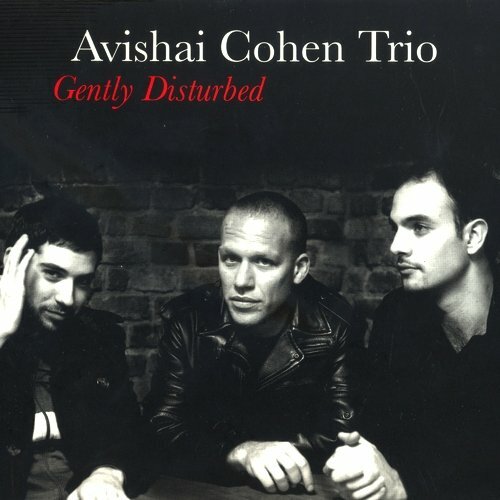 This composition is, without doubt, a contemporary jazz masterpiece made by Avishai Cohen Trio. The entrance is made by the piano saying that "this is just the beginning, you won't believe what the song will turn out to be through the end." The drums and the bass start to play just when the piano begins for an almost-oriental tone. After that the contrabass dominates the rhythm which is well colored and evolved by the drums after the first half. Although the album belongs to a bassist, this song is surely the drummer's song. Perfect attacks full of very fast and clean touches makes this song a continuous evolving one. You feel like it will never end and always rise to a higher level of tension but it is suddenly terminated by the drummer. The last surprise of Avishai and Shai is the last note of contrabass&piano trying to tell that they are still there. Gently Disturbed: Having the name of the album, this song’s tension is very low comparing to what I have expected after Eleven Wives. A monotone contrabass followed by piano is deeply accompanied by drums sometimes warning the others by hitting on the snare drum. I can feel the word “Disturbed” in the song but in a gentle way. The Ever Evolving Etude: This is a difficult lesson for the composers. What is done by Avishai and Shai is stil confusing my mind. After a 45 seconds entrance the piano play a solo then the contrabass play the same notes with the piano together. Then suddenly they decided to share the notes: one for contrabass, one for piano. Wow, this is really something different for me. Then with a faster tempo they play together but from time to time they still give some rest and listen to the other. After the first half, the drummer decided to enter and give a direction to the sound (Mark is a great drummer). He is now the aggressive ruler. Wow, this song is really ever evolving. Will it stop? Variations in G Minor: Avishai gives some clues about another emotional song. This is really something from hometown, a little Mediterranean taste. Shai and Mark is accompanying Avishai in this song, our heroic bassist. Mark is performing very well with his ultra-high speed sticks in on the crashes and hi-hat. Umray: A very avant garde composition welcomes us in the beginning. A slower second half full of piano playing of virtuoso Shai Meastro is the main subject of this song. Avishai sometimes uses bow in this song. Mark is silent generally but still take action when necessary. The record is state of art. There is nothing to say any bad thing about it. I made the review from the CD but you can also find the LP of this album. But, IMO, CD sounds better. Generally speaking bass and drums records are wonderful and very well located in the stage and they sound very organic. Same thing can be said for the piano but not for all song, maybe a result of intentional choice.